When this publishes my pictures will be one on top of the other, I still have not figured out how to put them side by side. 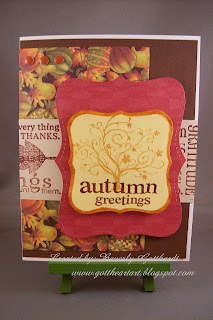 This card is only for 1 Challenge, but, since I love the autumn months best, I think this card is a pretty thing. I'm still working that Debbie Mumm Harvest & Holiday stack I got last year at Jo-Ann's, and you're fixing to start seeing some Christmas cards made out of that stack next. All these companies really know how to work us tool collectors. I have the Spellbinders Nestabilities Label One set, which we all know we love the nesting thing going on, but then Stampin Up came out with the Bigz Top Note die and the curly label punch. Wouldn't you know that you just have to have those also because they all work together so well. Then, used the Lg. Bright Blessings wheel on this card also. I bought some wheels a few years ago, but didn't really learn how to use them and the ink cartiridges that go with them, my loss, because now that I have caught on Stampin Up doesn't have as many neat wheels as they used to. And finally, I have to say I just love Inkadinkado stamps, this tree is one of my favorites, it always makes me think of Winnie the Pooh saying, "It's a blustery day". 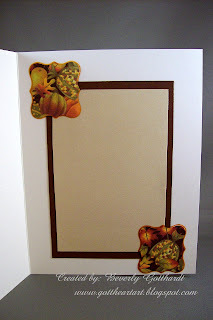 Supplies: Card Blank Ivory 5" X 6 1/2" Value Pack Hobby Lobby, brown, cream, tan card stock my stash, Debbie Mumm Harvest & Holiday stack-Jo-Ann's, Stampin Up: Lg. Wheel-Bright Blessings, Ink: Stampin Up-Bravo Burgandy, CTMH-goldrush, VersaMark Ink Pad, CTMH marker-goldrush, Jo-Ann's clear embossing powder, Stamps: Inkadinkado-98549 Autumn Foliage, 97513 Fall Season, Colorbok-metal dots, Spellbinders Nestabilities-Label One, Stampin Up: curly label punch, Bigz Top Note die, pop dots. This is really pretty! I love the fall colors! Thanks for playing along with 2RedBananas! Very pretty card. I love that tree, it is so pretty. And all the Fall papers and colors are great. Thanks for playing in 2RB's challenge.